K-Rex Finishes P4 & P5 at St. Petersburg Grand Prix USF 2K Opening Rounds 1 & 2! The St. Pete Grand Prix got underway with a single limited practice session. A 30 minute practice was scheduled but this was shortened to 6 laps due to red flags and course shut-downs. The newly resurfaced street course also had yet to be tested for racing, and the USF 2K drivers (Kaylen’s series) were the 1st to roll on the surface. During the practice a new bump on the course was discovered that lifted all four wheels of the cars off the surface while braking for Turn 3 and headed straight toward the barriers. This resulted in several crashes before the course was shut down. Recognizing the dangerous circumstances, race officials placed a curb and chicane around the bump for the entire Grand Prix race schedule, forcing drivers to slow to go around the bump. With 6 laps of experience on a new race surface and street course, drivers needed to dig deep for time in the qualifying session up next morning. Friday would consist of two qualifying sessions and Saturday would include two races. Team Pelfrey was 5th on the pit row placing them as the 5th team able to drive out. The poor pit position led to struggles in both qualifying sessions. During qualifying Team Pelfrey drivers had to clear other drivers to complete a fast lap and were often bogged down as they caught up to slower drivers. Kaylen led the field in P1 for several laps with confidence in both speed and commitment, coming to terms quickly with available tire grip. 3 minutes before session close, Kaylen was P3 and the session was red flagged due to an on-course incident. When the track went green, all drivers hustled a lap to warm tires. As each warm-up lap required 1.5 minutes, time on track was tight with 3 minutes remaining. When drivers crossed the timing beacon, only the 5 front drivers were allowed to complete a 2nd lap and none of these were from Team Pelfrey – again due to the 5th place pit position. This resulted in very fast times for those 5 drivers and ultimately moved Kaylen to P5 for qualifying. The track was increasingly faster due to improved grip from the many race series and sessions on track. Traffic was heavy and Kaylen again struggled to get a clean lap without being slowed by other drivers. Toward the end of the session Kaylen placed P4, however, the entire team had their fast laps revoked for exceeding the allowable speed limit during a waving yellow caution flag. This demoted Kaylen to P7. Drivers paired up at the start in 12 rows. As the flag man waved the green, drivers raced down the mile long straight-away climbing to 135 mph in a rush to get to Turn 1. Kaylen began the race in P5, but arriving at Turn 1 was chaotic and Kaylen was shuffled back to P7. Working the course, Kaylen recovered to P5 within 3 laps. 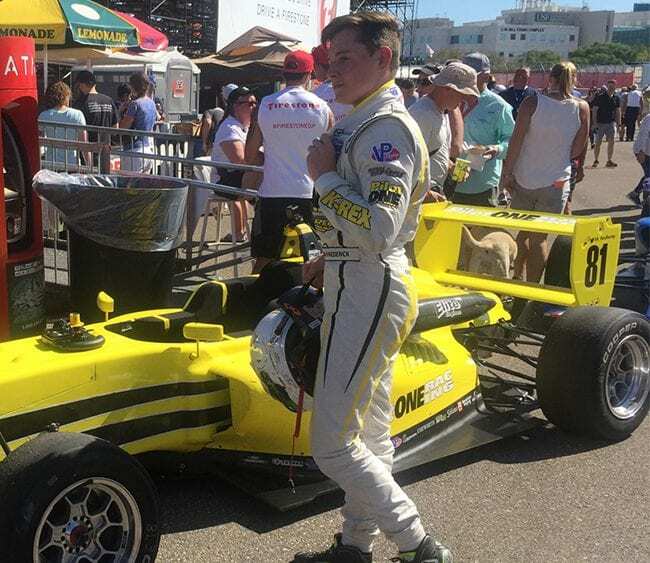 Toward the end of the race, while under pressure from veteran series driver Dakota Dickerson, Kaylen overtook the USF 2K 2016 runner-up runner up champion Thompson and finished fourth. The 2017 K-Rex races were underway with a solid Top 5 finish. The Race 2 start was equally chaotic. Beginning the race in P7 Kaylen dove left to avoid a crashed driver and swung into another driver, also in avoidance mode. Kaylen tapped a driver in front of him and took out the tip of his front nose leaving a 6” oval hole into the car. The car was drivable and the race went on. The opening had aerodynamic consequences as it slowed his top speed on the straights. All was not bad however as K later commented he appreciated the air conditioning: ‘The coolest race I’ve driven.’ Steadily Kaylen picked off drivers. In spite of struggling with top speed, K managed to hold off attacking drivers on the straight and would overtake in turns. Working his way up during the race, P6, P5, P4, Kaylen move into P3 with two laps remaining in the race. The front straight was clearly a struggle for Kaylen as other drivers would catch him up. On the last lap, Kaylen drove onto the front straightaway and moved to the inside of the turn to block aggressive last lap moves from challengers. Two drivers hemmed him in from both sides. Going into the brake zone of Turn 1 Kaylen locked his brakes on the airport landing strip wide paint lines with tires smoking. Both drivers overtook Kaylen who slipped back to finish P5. As this was Kaylen’s 1st street race (on a downtown street circuit), his team instructed him to relax, finish P8 or better, and collect points. Bettering upon the team goals Kaylen collected enough points to place 4th in the championship. Recognized now as a challenger for the championship, Kaylen caught the attention of the media with his speed and young age. Because of the points the team collected, Kaylen and Team Pelfrey will be No. 1 at the pit exit next race, and this will enable higher qualifying results. Frederick and Dickerson completed the top six ahead of Syracuse, N.Y.’s Devin Wojcik, who drove a strong race to seventh for ArmsUp Motorsports ahead of Kory Enders (DEForce Racing), from Warwick, N.Y., Das (who claimed the Tilton Hard Charger Award after fighting his way up from 18th on the grid) and Ming.